http://spuf.org/wp-content/uploads/2015/12/snowstorm.jsThe title’s a double entendre; I plan to discuss two different aspects of Competition in TF2. The first is competition as a league. We had a very interesting conversation on SPUF recently where we discussed the definition of an e-sport and whether TF2 even qualifies. Fundamental aspects like random crits need to be turned off, classes and maps and weapons need to be restricted, even certain cosmetics and sprays need to be blocked in order to balance the playing field. Can TF2 really count as a competitive game when it needs to be so heavily adjusted that it’s almost a different game? To answer that, I’d like to take you on a trip down Aabicus Memory Lane, to my elementary school. During recess and lunch, I would join a huge mass of fellow students to the grassy hills beside the campus to play soccer. One goal was a pair of ash trees near the perimeter fence and the other was a set of faded traffic cones. The ground was lumpy and there were no goalkeepers. Nothing determined who played for what team other than which goal they kept trying to kick the ball through. Sometimes there were multiple balls. Nobody kept score and the game ended when the recess bell rang (or some idiot kicked the ball over the fence). The relationship between what we were playing and a FIFA Championship match was tenuous at best, but we were still both playing soccer. There’s actually an entire community of Humongous Entertainment speedrunners who compete for times. They stream themselves on Twitch with plugins tracking segments of the gameplay speeds down to the millisecond. That level of regimented structure is the very definition that elevates a game into a sport. So I can’t really understand people who claim TF2 could never be an e-sport. 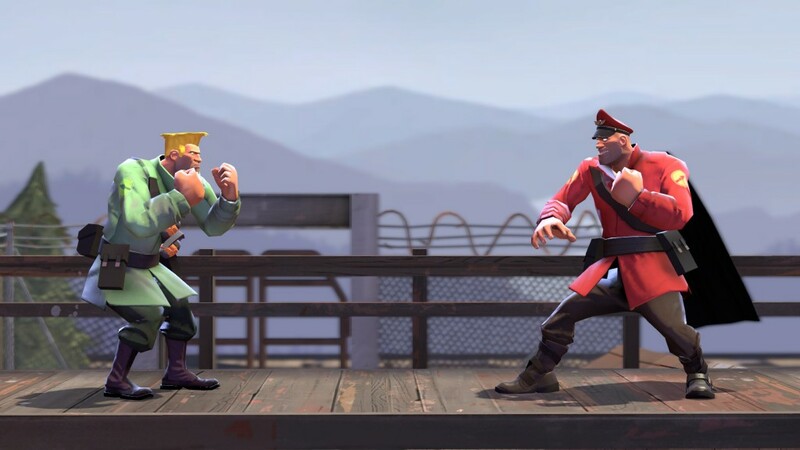 On to Part 2, where we talk about extra-curricular TF2 competition! By which I mean other games. Overwatch entering closed beta has gotten a lot of people excited, myself included. I don’t actually plan on playing the game, these days I’ve found myself a lot more into third-person shooters and PvE co-op games so it’s a bit out of my interest range, but it looks like a solid game that’s gotten a lot of people excited. What bothers me is when people predict the affects the game will have on TF2, sometimes going so far as to predict that it could be “the game that finally kills TF2”. Anyone remember Battlefield Heroes (2009) ? How about Brink (2011), Super Monday Night Combat (2012), Gotham City Impostors (2013), or Loadout (2014)? These “competitors” come and go, and all they really prove is that every game has its own cross to bear. Their death does not mean TF2 ‘defeated’ them, and if one can ever come out that endures and becomes successful in its own right, good for it, but TF2’s going to stick around just as well. If/when TF2 ever finally dies, it won’t be because of one of these replacements, it’ll be because of itself. But like I said before, I don’t think that’s happening any time soon.